The dichotomy was there in his art. On the surface, his paintings often seemed to be realistic depictions of everyday life. But there was always a twist that made the viewer do a double take. Was that a train roaring out of a fireplace? Red bricks in a picture frame? A water glass balanced on top of an open umbrella? A crescent moon trapped in a tree? Born November 21, 1898 in Lessines, Belgium, Magritte’s father was a tailor and textile merchant. His mother had been a milliner prior to marriage. Emotionally unstable, she had attempted suicide numerous times, and after one such attempt, her husband locked her in a bedroom to prevent any further self-destructive tendencies. It was not a solution, however. One day in 1912, her clothed body was found face down in a river. Her dress covered her head, and some have theorized that Magritte’s tendency to cover the faces of the figures in his paintings, as in “The Lovers” and “The Pleasure Principle,” is a clue that the tragedy may have been the springboard for much of his art. Like Edgar Allan Poe, Magritte certainly had a fascination with death and the macabre. As a boy, he frequently played in a graveyard, and in adulthood when visiting a friend who was a coffin maker, spent part of a day at rest in a casket with a sliding window that revealed the face of its occupant. The year after his mother’s suicide, he met Georgette Berger. She would become both his favorite model and, in 1922, his wife. His interest in art burgeoned when he took drawing and painting classes at school. From 1916-1918, he studied at the Academie Royale des Beaux-Arts in Brussels. He was soon mingling with artists from the young avant garde movement, and began sharing a studio with Pierre Flouquet. He was not interested in following the same artistic path, however, and was instead attracted to surrealism which was beginning to take hold in Paris. Through art dealer E.L.T. Mesens, whose surrealist collages had an international reputation, Magritte saw a reproduction of Giorgio de Chirico’s “The Song of Love,” and remembered being moved to tears. “Chirico was the first to dream of what must be painted and not how to paint,” Magritte explained to a friend. He sold his first painting, a portrait of singer Evelyne Brelia, in 1923, and two years later produced “Le Jockey Perdu,” his first surrealist painting. One of Magritte’s most famous paintings is 1964's “The Son of Man,” which was a self-portrait, but with his trademark surreal touch. A man in a suit and bowler hat is pictured standing against a small brick wall with the sky and sea behind him. The man’s face is mostly hidden by an apple. 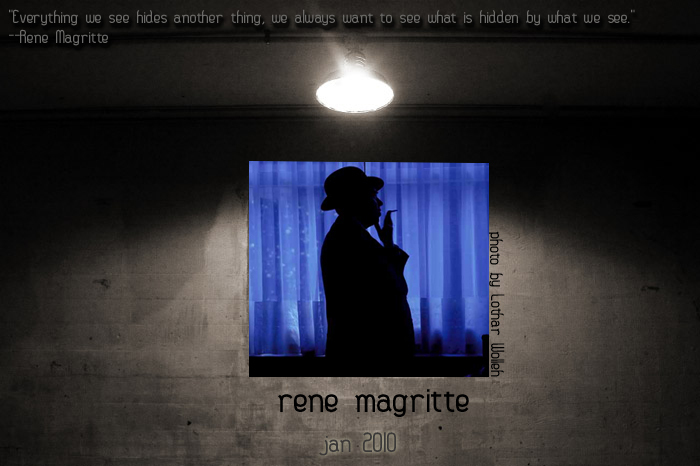 Magritte’s reputation began to soar in the 1960s, a decade when surrealism was not only finding renewed acceptance in the visual arts, but finding its way into popular music by way of the Beatles (“Eleanor Rigby, wearing a face that she keeps in a jar by the door”) and Bob Dylan (“he just smoked my eyelids and punched my cigarette”). It was during a 1965 exhibit at the Museum of Modern Art in New York that Magritte made his only visit to the United States. At the time, he also visited Houston, Texas where a smaller exhibit of his work was held at the University of St. Thomas. “He had a simply wonderful time,” a friend remembered. “He bought a ten-gallon hat, and went to a rodeo. Magritte may not be as famous as Dali, but his striking surreal imagery has seeped into popular culture as much as the work of more public artists, but as subtly and quietly as the man himself. You can find Magritte in some very unlikely places. Although May Routh, the costume designer for the 1979 film Being There,never heard Magritte discussed while the film was in production, the film’s poster shows the artist’s influence with its depiction of Peter Sellers in a bowler hat twirling an umbrella. The image was clearly inspired by, and pays homage to, Magritte’s painting “The Son of Man.” The 1999 remake of The Thomas Crown Affair also saluted Magritte in a scene featuring dozens of men in bowler hats, all carrying briefcases stuffed with reproductions of the painting. The cover art for Jackson Browne’s 1974 album, Late for the Sky, was inspired by Magritte’s painting “L’Empire des Lumieres,” and according to actress Ellen Burstyn, the poster for the 1973 shocker, The Exorcist, was based on the same painting. In 1972, playwright Tom Stoppard found inspiration in the artist’s work for a one act comedy titled After Magritte. Magritte’s oddest appearance in pop culture may have come on Paul Simon’s 1983 Hearts and Bones album which includes the song, “Rene and Georgette Magritte With Their Dog After the War.” Simon said, “That was a caption of a photograph in a book I was reading, and I thought, that’s an interesting title for a song.” In the song, Simon imagines Magritte and his wife dancing “by the light of the moon/To the penguins, the moonglows/The orioles and the Five Satins/The deep forbidden music they’d been longing for.” As for its meaning, Rolling Stone suggested the songwriter “obviously identifies with the figure of the grown-up, respectable artist irrevocably smitten with those doo-wop groups,” but Magritte would probably have dismissed any attempt at such an interpretation.